A pair of devices found outside a Buffalo Police station early Friday morning were built to look like pipe bombs but later deemed non-functional by the Erie County Bomb Squad, said police officials who are now looking for the individual seen delivering them. 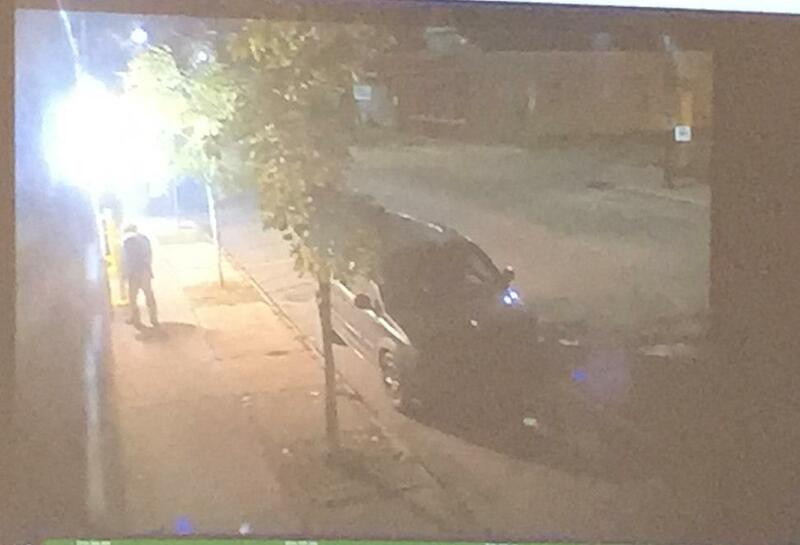 Captain Jeff Rinaldo showed video captured by a street surveillance camera on South Park about 3:30 a.m. Friday. It shows a suspect, believed to be a male, walking up to the South District Station public entrance, placing a pair of devices on the ground just outside the door and then walking away. A still shot of street surveillance video on South Park shows an individual arriving at the public entrance to the Buffalo Police South District Station early Friday morning. That person is seen placing a suspicious pair of devices made to look like a pipe bomb outside the door. The devices were deemed harmless but the suspect remained at large. The custodial staff found the objects more than an hour later and alerted police who, in turn, notified the Erie County Bomb Squad. That agency removed the device and analyzed it, finding it was non-functional and posed no threat. "The lighting is a little bit difficult but we were able to enhance the video a little bit and it looks as if they were at least wearing some type of camouflage, a heavier coat and possibly a hat on their head," Rinaldo said. "At this point, it's kind of the description. It's difficult to tell if we're looking for a white male or a black male but the person appears to be 5 feet 10 to six feet tall." Police are not releasing images of the devices to help to protect their investigation. Rinaldo said while perhaps the suspect may have been inspired by the actions of a nationwide distribution of suspicious devices to key political figures, this incident is isolated and the police station received no prior threats. Although the devices posed no threat, they are working with the FBI to find the suspect. "Whether it's a functioning bomb or not, even if it's a kid's toy piece of dynamite or something you'd use for a costume, when you do what you see in this video, you're guilty of a D felony," Rinaldo said. "We will treat this as serious as if it was an actual pipe bomb." The person found to have planted the devices could face a year in prison or, if the suspect has a prior criminal record, could face up to fifteen years, Rinaldo added. Leaders of several Buffalo-based churches invited representatives of law enforcement agencies and City Hall to a meeting, where it was discussed how to improve cooperation to address violent crime. Clergy say they previously planned the meeting but also invited government leaders to ask how the churches might help. Buffalo Police conducting a narcotics investigation made an unexpected discovery: dozens of bicycles that investigators believe were stolen over the past several weeks or months. They're now beginning the laborious task of trying to reunite them with their rightful owners.